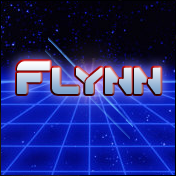 Flynn is a sci-fi typeface is based on the title logos of “Tron” and “Tron: Legacy” from Walt Disney pictures. Includes basic alphabet and symbols. Includes hollow and italic versions. This entry was posted in Font Updates on May 17, 2016 by Jaynz. How can I buy this font for commercial using of letter F? There’s no way to license a particular letter from a font, but you can license the font here http://www.pixelsagas.com/?download=flynn for $9.99.